God took six days to create the world. He separated light from darkness, created animals and plant life, filled the oceans and breathed life into the man. 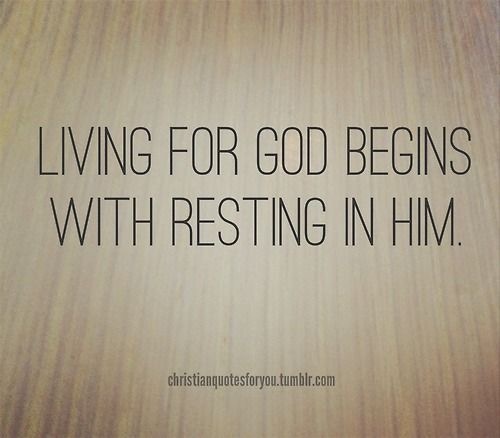 He created then He rested. He didn’t rest because he was tired, he rested to set an example for us. The work was finished and He celebrated it. He took time to revel in it, enjoy it, celebrate it and then named it Sabbath. A stopping point, a ceasing place. He took the time to recognize the wonder of new life and joy of new relationships. Jesus uttered the words “it is finished” on the cross. The work to reconcile you to God is done. You can’t add to what was done on the Cross or take anything away from it. You can’t make yourself “more right” or less right” with God. What you can do is receive it. What you must do is rest in it. What you can do is celebrate it. Make time to recognize the wonder this life and joy of newly created moments and relationships. Make time to celebrate what God is creating in your life and enjoy your relationship with Him. When you do, a deep rest will settle in your soul and you will experience your life in a whole new way- the way God created you to experience it. May your day be filled with holy moments of continual stopping and celebrating the wonder of this life in Christ.